Table fountain can play an important role in decorating the office and home. Brought bubbling, flowing water into our lives and work areas to help bring back the natural feelings in our lives. Tabletop fountains adorn the rooms and stress reduction. 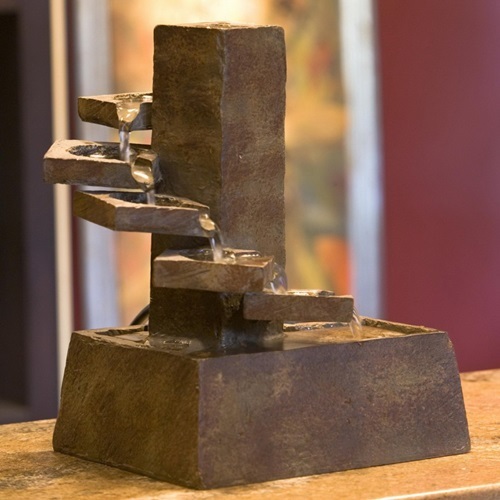 Many people want the fountain in the office or their home. Although the company offers water fountains in a variety of styles and prices, nothing can compare to the feeling of accomplishment from creating your own fountain. By building your own fountain, you can save money and choose the ingredients that will make a special fountain. The basic idea of creating a fountain that visualize how the flow of water and bubbles through and around rocks, wood, and whatever you choose in a way that sounds natural and looks fun. Building a fountain can be as simple as placing a few rocks and a small pump into a container with water. It does not have to be expensive or fancy. 1. Container that holds your fountain can vary greatly. You can use ceramic bowls, plastic flower pots, glass, or wooden boxes. The easiest and least expensive containers are plastic pots or ceramic bowls. Some plastic pots tend to vibrate when you put everything together. Ceramic bowl denser, reducing vibration. Plastic pots and ceramic bowls should not have holes in the bottom. 2. Fish tank pump is fine. Choose a small submersible water pump from a pet shop, hardware store or garden supply center. Pump should ideally have suction cups secure the foot to hold the pump in the bottom of the container, the motor is quiet, simple maintenance, and an output of less than 100 gallons per hour. The smallest ones work well for the typical size containers. 3. You will need about a foot of 1/2 inch (inner dimension of the pipe) or 5/8 inch (outside dimension) clear plastic tubing from the hardware store or pet supply stores. Cut a length of pipe to fit the container and design. To straighten the hose, boil in water for a while. 4. Go to a pet or aquarium store for bags rocks and stones that usually come in different sizes, shapes, and colors. You can also collect your own stone and gravel from streams and ponds throughout. 5. Most plants can be rooted in water so they take clippings for your fountain. Eventually, the roots will intertwine through the rock so repeat your fountain, or just leave the plant itself if fine. Check the water level every day for the first week, adding fresh water needed to keep the pump is completely closed. Water should be added to the fountain when needed, make sure the water level does not drop below the height of the water pump. You can add a little bleach to the water to clean the fountain. Periodically, clean the fountains, containers, pumps, rocks, etc. to remove the slime and algae. Now, smallest water pump for small fountains can you see every day.